Summary THE EAGLE HUNTRESS is a documentary that follows a 13-year-old Mongolian girl as she and her golden eagle train to become champion hunters. 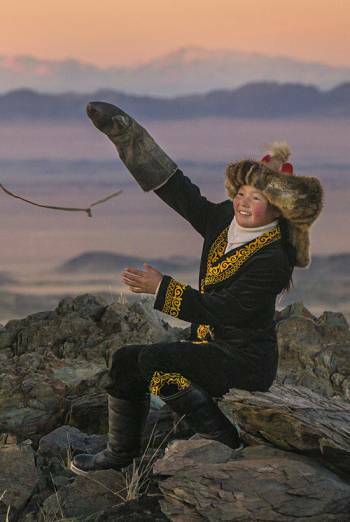 THE EAGLE HUNTRESS is a documentary that follows a 13-year-old Mongolian girl as she and her golden eagle train to become champion hunters. There is a sequence in which a young golden eagle hunts foxes. After an attack a fox has a little blood on its snout as it runs away. A fox is killed by the bird, although the kill is shown with little detail. It is implied that a man slaughters a lamb and a man is briefly seen skinning a hanging animal carcass. A teenage girl takes a young eaglet from its nest.